For the fourth year in a row, the PawSox teamed up with Jordan's furniture and collected new/used baseball equipment during the 2017 season to benefit aspiring young baseball players at the Boys & Girls Club of Pawtucket. "This equipment changes lives," said Jim Hoyt, CEO of the Boys & Girls Club of Pawtucket. "We'd once again like to thank the Pawtucket Red Sox and Jordan's Furniture for their generosity." 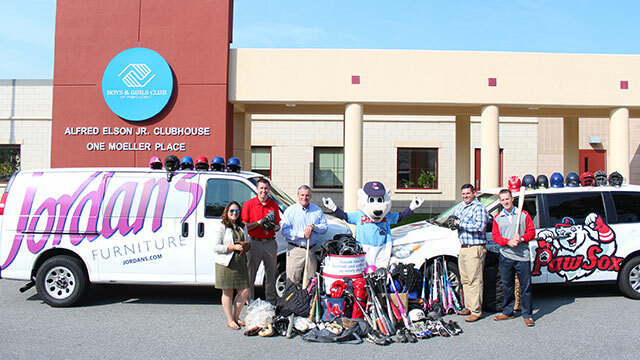 "Dropping the equipment off to the Boys & Girls Club at the end of each season is something that we look forward to every year," said PawSox Director of Communications & Community Relations, Joe Bradlee. "We're able to see first-hand the impact we are making on so many young athletes in the area."